The Family Educational Rights and Privacy Act (FERPA), affords certain rights to students concerning the privacy of, and access to, their education records. Students may choose to complete and submit the below form allowing the release of their education records to specified third parties. 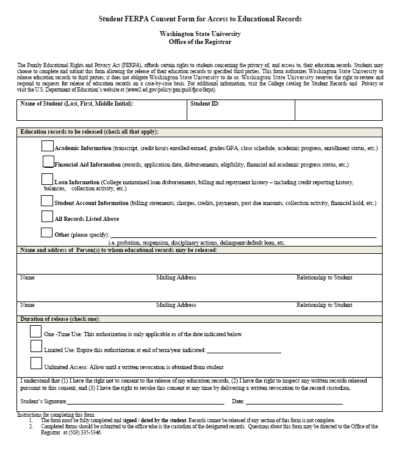 This form authorizes Washington State University to release education records to to third parties; it does not obligate Washington State University to do so. Washington State University reserves the right to review and respond to requests for release of education records on a case-by-case basis. the form may be sent via email to health.professions@wsu.edu from the student’s Washington State University email address. The form may not be sent from an email address not belonging to the student who filled out the form or from a non-Washington State University email.